In recent decades, five to ten times as many persons have turned out for the Olympic flame relay as have watched Olympic sports contests live. 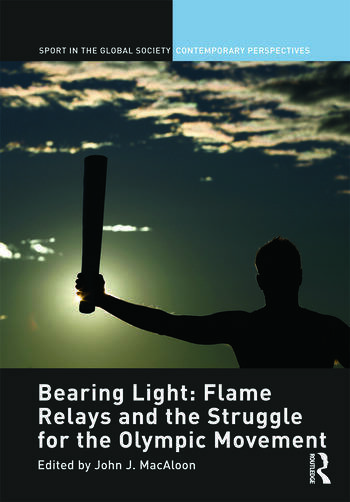 Flame Relays and the Struggle for the Olympic Movement: Bearing Light, the first anthropological analysis of the contemporary torch relay, exposes and interprets the transformation of the ritual across a 25-year period, from Los Angeles 1984 through the IOC’s 2009 announcement that, in the aftermath of the politically contentious Beijing performance, there will be no more global relays. This volume offers a rare case study of continuity and change in a leading transnational and trans-cultural ritual form. Through data publicly revealed for the first time, the reader is carried fully backstage and into the conflicts and negotiations among Olympic organizing committees, the Greek Olympic movement, national governments, and transnational actors like the IOC, commercial sponsors, and operations management firms. Readers will come to know the leading flame relay authorities and practitioners, gaining a deeper understanding of the Olympic managerial revolution with its characteristic ‘world’s best practice’ language. Analysis of the transnational flow of Olympic operations management offers important corrections to much existing globalization theory by demonstrating both how powerful and how culturally and politically parochial world’s best practices can turn out to be. The dialectic between the cultural performance genres of ritual and spectacle provides a further intellectual architecture for these studies posing the question of whether the Olympic Movement will be able to survive the successes of the Olympic Sports Industry. John J. MacAloon is Professor and Academic Associate Dean in the Social Sciences Graduate Division and Professor in The College at The University of Chicago. His anthropological and historical studies of the modern Olympic Movement and Olympic Games have earned a global reputation. He was an executive member of the International Olympic Committee 2000 Reform Commission and has advised many Olympic bid and organizing committees and National Olympic Committees.